George Clooney takes care of his friends. Rande Gerber, who along with George Clooney cofounded the Casamigos Tequila Company, said the actor surprised 14 of his closest friends by making the millionaires. He gave each of them a large suitcase that held $1 million in $20 bills. 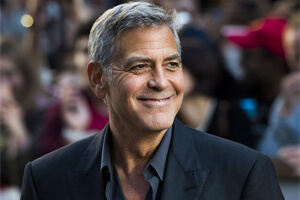 George Clooney has an estimated net worth of around $550 million. He honored his friends, all of who supported him one way or another while he was a struggling actor, at a private dinner party at his estate. The group of friends is commonly called, “The Boys,” and Clooney wanted them to know how much he appreciated all of their support before he was a major Hollywood success. The dinner party happened on September 27, 2013 and was recently revealed by Rande Gerber on MSNBC’s program Headliners. When the guests arrived, there were black suitcases waiting for each of them at spots around the dinner table. "These are George’s closest friend who took care of him while he was struggling. George wanted to show them how much he appreciated their help and support during his early years," Gerber said. "And then George said, 'Not only that, I have paid everyone's taxes so this million dollars is yours.'" Rande said he tried to refuse George’s gift, but George insisted. Rande is independently wealthy through numerous business ventures, including the Casamigos Tequila Company. Rande said he ended up donating the entire $1 million to charity.